Last year around the beginning of summer Alabama had very little rain. June was unseasonably hot, followed by a severe summertime drought in July, August and September and highs of over 100 degrees. For the first time during a summer season, Lay Lake was slowly lowered to a few feet below normal, full pool level. With enough rain all throughout this past spring season, Lay lake was currently at full pool the first week of June. But what will this summer season hold? No rain for months, can take its toll quick and the statewide scene of constantly falling lake levels, could take place once again…just like last year. So keep this in mind before planing your next trip to Lay Lake. Call 1-800-lakes-11 for daily lake levels (full pool is 396.0) and water generation schedules. Make sure you always check the water generation schedules for both Lay lake dam and upstream, Logan Martin Lake dam. Some anglers may fail to recognize the importance of doing so. 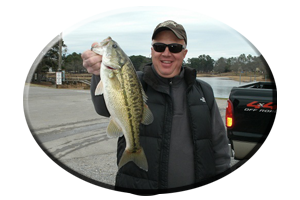 Knowing the current lake level and scheduled water generation times, can aid you in your search for both species of bass on Lay Lake. The daily habits of the Coosa River spotted bass and Lay lakes weed dwelling largemouth bass are greatly influenced by the lakes rising waters, its falling waters or by the current created by water generation. 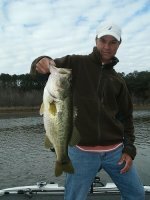 Using this information wisely (provided for free by Alabama Power Company), can help you in your decision on where to fish, what time you should be fishing on certain locations throughout the entire lake, what lures you should be fishing and even the manner in which you present each and every lure. 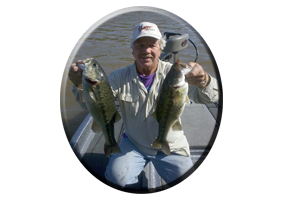 * Checking both the lake level and the water generation schedules for several days prior to your trip, gives you an idea of what effect it has on these Lay lake bass, when you arrive. Lay Lake generally stays at or near full pool all throughout the entire year. It is one of three lakes on the lower Coosa River System (Mitchell Lake and Jordan Lake being the other two), that has traditionally been kept at full pool year round, despite the season. Excluding last summer’s drought. * There are three lakes on the upper Coosa River system, Weiss Lake, Neely Henry Lake and Logan Martin Lake, that are lowered for winter pool. Rising or falling lake levels always affect the habits of Lay lakes bass. Especially largemouth bass. Spotted bass found on the main lake, are not bothered by falling lake levels. If the lake is falling and it drops as much as 8-10 inches in a days time, it has no effect on main lake bass, most of which are spotted bass relating to current edges along deep water drops. They adjust rather easily. But Lay lake’s largemouth bass – many of which thrive in Lay’s weedy, creek backwaters, along small cuts and pockets, along the many miles of creek flats and those bass found on main lake flats – are all greatly affected with fluctuating water levels. Often as little as a drop of 6 inches of water, can send them swimming for deeper water nearby, sometimes far away from the shallows. Backwaters displaying 1-2 feet of water or less, can become completely void of largemouth bass, if lake levels suddenly fall. If Lay lakes waters drop 2-3 feet like last summer, it will be weeks before bass again invade shallow creek backwaters, those places normally far from the security of deeper main lake waters. 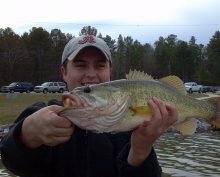 Only when Lay lake’s lake levels stabilize and its waters stop falling, will these bass move back into these places. 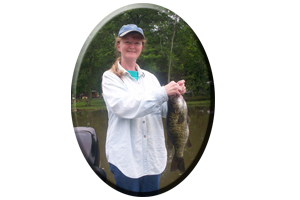 Again, main lake bass adjust simply by moving to weed edges, along stump rows, and feeding and holding around any sudden drop-off or bottom change. 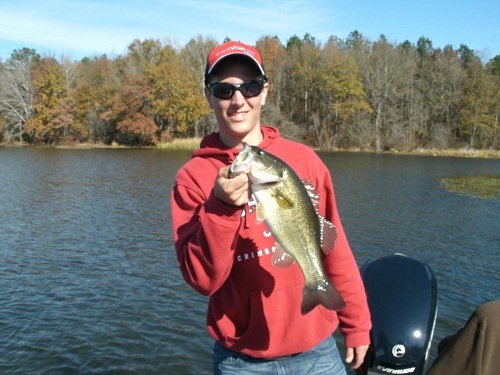 Until conditions stabilize, stick with fishing the main lake during low water periods. On the other hand, if lake levels suddenly rise so will the bass, further up in the newly flooded shallows. For as most anglers know, flooded waters always means new meals will suddenly be on the shallow water menu. Rarely does this happen on Lay lake during the hot days of summer. It takes a lot of rain or plenty of constant evening thundershowers, for anglers to see Lay lake get over full pool. But when it does, just like the bass, anglers should head for the shallows. You can’t have rising waters or falling lake levels without water generation. Water allowed to go through the dam – to generate electricity – creates current, that always brings the bass their meals. Both spotted bass and largemouth bass will feed according to the water generation schedules. If the water is on and moving, they move up in huge summertime school’s along main lake flats, points, around current breaking cover like stumps and standing timber and along islands and creek mouths. * Water generation at both dams is usually evident from Monday – Saturday and this generally keeps the lake at / or over full pool. Or it can cause the lake to be slightly down a few inches. Often (unknown to many anglers), on Sunday, there can be no water generation and the lake can get over full pool by mid morning. Or the lower Lay Lake dam can be closed on Sunday and the upper Logan Martin Lake dam will be letting water into the lake, slowly filling it up. With water coming into the lake from Logan Martin dam (including any rain run-off from recent rains entering the lake via its many feeders creeks), the lake can rise anywhere from 6 inches to one foot in a days time. Knowing the water generation schedule is important. When you call 1-800-lakes-11 the recorded voice will also give you the future water generation schedules. So if your planning a weekend trip, a call on Thursday or Friday, could help you plan your fishing trip for Saturday or Sunday. As summer gets underway so do the lakes aquatic weeds. They thrive in the summer sun. Even when Lay lake was lowered last summer (the weeds that were already growing underwater were rejuvenated when exposed to sunlight), the weeds found along the new shoreline thrived and the bass moved right in. Most anglers that fish Lay lake during the summer months will fish some type of aquatic weeds, whether they fish during the day or at night. Techniques for targeting these Lay lake bass in the weeds are many. Keep in mind you are fishing for largemouth bass. They don’t call them largemouth’s for nothing. Big bass want a big meal. Meaning tailoring your offerings on the bigger side, to entice those much bigger largemouth bass, hidden within the many miles of aquatic weeds lining Lay Lakes shoreline. Describing each and every lure and technique for fishing in and around Lay Lakes weedy shores could get rather lengthy. There are literally dozens of lures and many, many ways to fish them, that entices Lay lakes lure-oriented largemouth bass into striking. To many to list, but there are local favorites, that do get the strikes. First you have got to have the right lures within this huge lure category, including the right line, rods, reels, sharp hooks and equipment like a good, long handled net. To be successful you must have confidence and you must, for sure be fishing each and every lure, in the right place, in the right manner, for even hoping of any success. That’s why some anglers that frequent Lay lake (like bass tournament anglers), are very tight lipped about what they fish with and where they fish as well. Many tournament anglers will put away all their rods, lures and tackle boxes and even do away with any visible sign of a lure, cleaning up their boat before heading back to the dock in the evening. Just in case any anglers (those that did not do so well), are scrutinizing their boats for tidbits of information when they tie up at the dock. Still there are signs they forgot. * Anglers that fish Lay lakes shallow stained creeks usually have a mud line around their boats. Anglers that fish in very shallow water always have their trolling motor positioned as high as they can get it. Anglers that fish a lot of weeds have weeds still in their boats by days end. Even cup holders in the boat, or even the net, can have lures in them…they over looked. * Actually, The best advice I can say to any angler new to this sport is; develop some fish catching techniques of your own, find some of your own fishing spots, fish with confidence lures, those lures you know catch fish, and on each and every trip, always explore new places and at least try to develop a few new techniques of your own. You may be surprised in the results and then you can say, you did it all on your own! Like said, there are many lure choices, lure colors, various lure sizes and styles, including favorite lure manufactures to choose from. But time and again (like on any lake you fish), there are always some certain lures that will always fool the bass. Getting Lay lakes bass to bite can mean having a lure they do not see very much and believe me they do see a lot of lures! Or a technique that other anglers do not employ. So here’s some of my favorites and some of those (that some tournament anglers don’t know I know), that may help you get those often hard to entice Lay lake bass to bite this summer season. Whether you fish day or night on this lake you are really missing out if at some time you do not fish with some type of topwater lure. This can mean fishing with some very weedless lures in the weeds or targeting cruising bass in open water, around weeds, wood and rock cover. First on my list for targeting bass in the weeds would be either a hollow bodied frog or a rat featuring a trailing skirt with two upturned hooks. Or one of today’s new soft bodied frogs with one inserted 5/0 hook. With so many weeds on Lay Lake, anglers should always have one of these lures tied on, preferably on 20 pound test monofilament line or braided line in the 30-40 pound test category, fished on a long 6 1/2 foot to 7 1/2 foot rod. Flipping rods work great. * NOTE – Always sharpen your hooks or buy frogs and rats with sharp, quality hooks. Hook sets are important. You can miss these bass exploding on your topwater frogs and rats, if you do not allow the bass a few seconds to inhale these topwater lures, before setting the hook. Colors of white, green, pumpkinseed, brown or chartreuse may be needed during the day. At night, stick with darker colored frogs like black, brown or dark green or fish hollow bodied frogs with contrasting colored skirts. You can also insert rattles in these frogs ands rats for aiding the bass in finding these lures within the weeds. Retrieves vary. Each an every angler swears by his own special retrieve. Short hops, with a steady cadence, allows the bass to track down the lure better and aids it in homing in for the kill. Or for bass lying in wait, it allows them to ready themselves, rather than trying to home in a fast, erratic retrieved frog or rat. Some soft bodied frogs, those fished with one inserted upturned hook, actually sound like a buzzbait when retrieved fast across the waters surface. One tip; Fish slow and be ready on every cast. * Frogs and Rats are not only fished in and around Lay lakes weeds, but they can be skipped up under piers and boat houses or even fished right up on the face of deep rock bluffs, for some very explosive strikes this summer, strikes other anglers fail to entice. Most anglers know buzzbaits are weedless topwater lures and they can be fished on the waters surface, right up in the weeds. 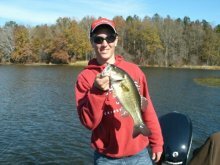 But so can spinnerbaits, of which most anglers fish at some time, that are fished right near the waters surface. I would suggest a trailer hook on both of these lures for short striking bass. Although at times bigger is better, smaller lures get more strikes in clear water and in highly pressured areas. Always try smaller buzzbaits and small profiled spinnerbaits. Chatter baits and other imitations of this vibrating, inline spinnerbait, fall in this category as well. Like most topwaters fished in and around weeds and wood cover the use of strong line is suggested. There many weedless lures that can be rigged with one hook. Soft jerkbaits come in all shapes and sizes. Most soft jerkbaits resemble baitfish like shad. Floating worms have air injected into them when poured and they attract big bass as well in and around weeds and wood cover on Lay Lake. Line test of 12-15 pounds is suggested with these lures. One lure that can be fished on bottom with a weight, or made to slowly fall with very little added weight, or fished weightless right up in the weeds, is a lizard. You can add rattles, fish attractants, or even dye the legs and tails of these lures for added appeal. Fishing a lizard with a slow, steady retrieve (similar to that of a buzzbait), while rigged weightless and cast among the weeds, is a deadly tactic for big bass on Lay lake. * With all three of these lures setting the hook, after you feel the bass or when the lure disappears, will result in more hook ups and fewer lost bass. Although swim baits are simply oversized soft plastic shad imitations, that many anglers have fished for years, for some anglers the newer oversized Swim Baits are a new tool recently added to their arsenal. There are various sizes, a rainbow of very realistic colors, enticing built in swimming actions, and even various types of shad imitations and bream imitations to choose from. Some of today’s swim baits feature a big, inserted hook. Some have a built in treble hook. While other swim bait models have both a treble hook and a single hook. Some swim baits fall slow while others sink fast, when not steadily retrieved. Which usually results in the most strikes. 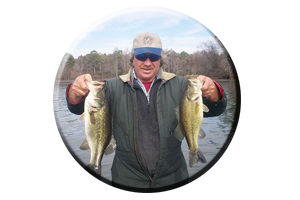 Fishing swim baits along Lay lakes weed lines can be a deadly tactic for fooling big bass cruising the weed edges, bass that do not see many of these types of over sized offerings. Heavy line of at least 20 pound test is suggested. 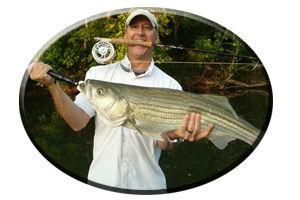 Fish swim baits with long casts on long, 6-8 foot rods and employ a very slow and steady retrieve at all times. If you miss a bass, just keep slowly reeling, for many big bass return for a second or even third strike, before actually inhaling the swim bait. These are just a few lures for fishing Lay lakes weedy waters this summer season. All of the aforementioned lures will work day or night while fishing on this lake all summer long. Develop a few more on your own. Big worms and lizards, crayfish imitations, jig combos, big tube baits and creature baits, sweet beavers, and small finesse worms all work very well when fishing on or near bottom on Lay Lake. At night, always make plans to fish some lighted piers, around boat houses and around well lit marinas, bridges and causeways, for big summertime bass.